Food has always been something that joins us to one another as we procure, prepare, and share meals. We gather around tables and enter the hallowed belonging and sacred union of fellowship. In this place, we reconnect with our true selves as reconciles and healers of the world who dine with justice and mercy, practice divine hospitality, and restore our bodies with God's gift of provision. Scripture likens Jesus to bread, an edible and necessary source of life. The Holy Spirit is likened to oil and anointing. The process of produce growth and pruning and harvesting is all through God's word. This six-session Bible study explores those metaphors focusing on a few select, but pointed examples that take us full-circle in the experience of harvesting a relationship with Christ. 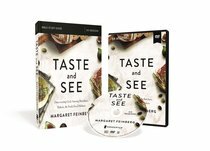 About "Taste and See: Savor God. Relish Friendship. Celebrate Life. 6 Sessions (Study Guide With Dvd)"